1. Sprouter: Sprouts are rich source of vitamin, mineral, amino acids, anti-oxidants, and proteins. Also they are very low in calories and fat but are highly filling. While we know the importance of sprouts, we all avoid the rigorous activity of sprouting using traditional cloth method. Sprouters available in the markets now-a-days makes this process very easy and encourages you to include sprouts in your diet on regular basis. 2. Air fryer: It is very difficult for a food loving Indian to avoid his samosas, pakoras, and French fries. If you are ready to invest some good amount of money, air fryers can make your life stress free as it allows you to indulge on these delicacies minus the guilt. 3. Copper water utensil: According to Ayurveda, water stored in a copper utensil is very helpful for the body as it helps in removing impurities from the body and boost immunity. Also, it makes the water bacteria and virus free. So bring the wisdom of Ayurveda to your kitchen this Diwali with a copper water utensil. 4. 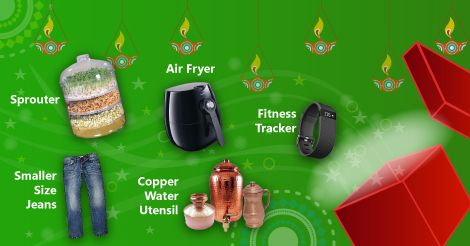 Fitness tracker: Purchase a fitness tracker this Diwali and get an idea of your routine energy expenditure. Plan your diet and fitness regime accordingly and achieve your targeted weight loss or muscle build-up. 5. A one size smaller Jeans: A very old but always a trendy method of encouraging yourself to become fit. Buy a one size smaller Jeans and pledge to fit into it by next Diwali.